Biosorption is a property of certain types of inactive, dead, microbial biomass to bind and concentrate heavy metals from even very dilute aqueous solutions. Biomass exhibits this property, acting just as a chemical substance, as an ion exchanger of biological origin. It is particularly the cell wall structure of certain algae, fungi and bacteria which was found responsible for this phenomenon. Opposite to biosorption is metabolically driven active bioaccumulation by living cells. That is an altogether different phenomenon requiring a different approach for its exploration. Pioneering research on biosorption of heavy metals at McGill University in Montreal has led to identification of a number of microbial biomass types which are extremely effective in concentrating metals. Some of the biomass types come as a waste by-product of large-scale industrial fermentations (the mold Rhizopus or the bacterium Bacillus subtilis ). Other metal-binding biomass types, certain abundant seaweeds (particularly brown algae e.g. 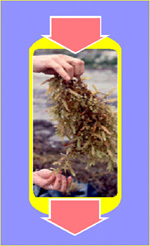 Sargassum, Ecklonia ), can be readily collected from the oceans. These biomass types, serving as a basis for metal biosorption processes, can accumulate in excess of 25% of their dry weight in deposited heavy metals: Pb, Cd, U, Cu, Zn, even Cr and others. Research on biosorption is revealing that it is sometimes a complex phenomenon where the metallic species could be deposited in the solid biosorbent through different sorption processes of ion exchange, complexation, chelation, microprecipitation, etc. A whole new family of suitably "formulated" biosorbents can be used in the process of metal removal and detoxification of industrial metal-bearing effluents. The sorption packed-column configuration is the most effective mode of application for the purpose. Recovery of the deposited metals from saturated biosorbent can be accomplished because they can often be easily released from the biosorbent in a concentrated wash solution which also regenerates the biosorbent for subsequent multiple reuse. This and extremely low cost of biosorbents makes the process highly economical and competitive particularly for environmental applications in detoxifying effluents of e.g. Different types of science background, from engineering to biochemistry, can make a significant contribution in elucidating the biosorption phenomenon. Interdisciplinary efforts are mandatory and represent quite a challenge. Preparing biosorption for application as a process requires mainly chemical engineering background. Good understanding of the sorption operation is mandatory. While ongoing research is essential for improving and optimizing metal biosorption effectiveness, wastewater purification applications of the biosorption process are readied for pilot testing of this alternative new technology. Optimization of specific biosorption process applications has to be done in conjunction with industrial users/clients and requires specific process engineering expertise and a serious development capital commitment.